DAVENPORT, IA--(Marketwire - January 21, 2008) - At Genesis Medical Center in Davenport, Iowa, leading-edge technology is replacing stitches with staples while surgeons operate on beating hearts. On Tuesday, February 5, 2008, you can see a live panel discussion regarding a coronary artery bypass graft, featuring a Cardica C-Port® Stapler. Genesis heart surgeons Nicholas Augelli, M.D., and Robert Fietsam, M.D., will host this interactive discussion. During the live webcast, you'll learn how surgeons use an automated device that deploys tiny, stainless steel staples to secure the bypass vessel to the coronary artery. They perform the coronary artery bypass surgery "off-pump," meaning while the heart is still beating and without using the heart-lung machine. A heart-lung machine temporarily takes over the work of the heart and lungs, allowing surgeons to work on a motionless muscle while they hand-sew spaghetti-thin vessels to bypass the blockage. For patients, the result is a quicker surgery; about a day less in the hospital; a faster recovery; and, if early studies hold true, a better chance that bypassed vessels will remain free of blockages over time. Drs. Augelli and Fietsam were the first in the Quad Cities and among the first in Iowa to use Cardica's C-Port system -- a stapling device to surgically link coronary arteries to bypass a blockage. The Genesis Heart Institute surgeons insert the anvil-like device in the coronary artery. With the press of a button, 12 staples -- or 24 clips -- fire around the vessel. Each clip is very, very small -- only 1/25th of an inch. The artery opens as it simultaneously is connected to the vein in a single, integrated procedure. And therein lies an important advantage: The automated process can be superior to traditional, technically demanding sutures that surround the vessel, and when tied, can sometimes create a "purse-string effect" that causes a narrowing effect and lessens the blood flow, Dr. Augelli says. "The stapling device standardizes the process of anastomosis -- the attaching of the end of a graft to a coronary artery during bypass surgery," Dr. Augelli says. "Each connection is always the same length, always the same size and allows the vessel to expand and contract with blood flow. Because there is no pursestring effect, you improve the flow through the graft right off the bat, which makes the likelihood that it's going to stay open much more significant." Using both the C-Port xA system and Flex A automated devices also are a lot quicker -- from 20 minutes down to about 3 minutes to connect a vessel. 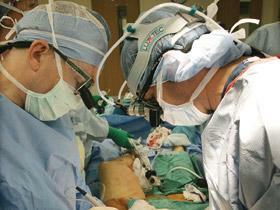 That's advantageous for patients during off-pump heart bypass surgery. "When we do bypass surgery on a beating heart, we press one part of the heart down so it will stay relatively immobile while we do the operation," Dr. Fietsam says. "If it takes 20 minutes, then that's the amount of time where the heart has the potential to be damaged. If we can do it in 3 minutes, it's much safer for the heart and also reduces the time that we have to squeeze down that part of the heart muscle." The C-Port device also can connect extremely small vessels, particularly those that have been difficult to bypass in the past. In the future, the device also will be instrumental as surgeons use robotics to achieve minimally invasive coronary bypass surgery -- without cracking open the chest and with a much smaller incision. "This is part of the puzzle," Dr. Fietsam says. "One of the advantages of the stapling devices is that you can put it into a small port and potentially staple and connect arteries without having to open the chest." The Flex A device was cleared by the FDA in April 2007. At Genesis, Drs. Augelli and Fietsam have been using it for about three months. A recent study revealed that grafts connected by the C-Port device remained open longer. "At six months, we have 88 percent of the hand-sewn still open. But when we use the C-port system, 95 percent are still open," Dr. Fietsam says. "We don't have 12-month, 2-year, 5-year results yet, but our hope is that the bypass will continue to stay open as well as it has in the first 6 months. Right now, 1 out of every 4 bypasses closes down 2-5 years out when sewn by hand." Cardiac surgery is a newcomer to stapling, even though it has been around as early as the '50s and has become routine in general surgery. Dr. Augelli likens stapling's debut to heart surgery to the advent of stents, the small metal coils used in cardiac catheterizations to prop open cleared vessels. "What needed to happen was for the staples to become miniaturized and automated," Dr. Augelli says. "Now that this has been achieved, we're hoping this will translate into more reliable anastomosis, long-term patency (the vessel remains open), and a better track record for surgery."